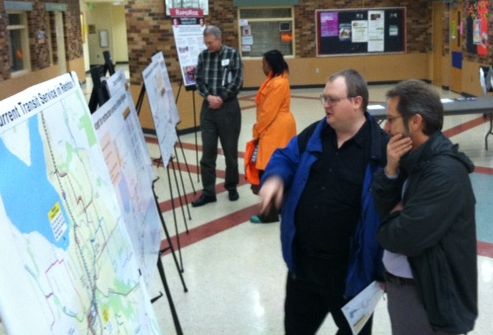 We’d like to thank everyone who gave us feedback on our proposal to change bus service in Renton when RapidRide F Line service begins in June 2014. The King County Council is now considering changes to Routes 110, 155, and 909 (DART). The Council’s Transportation Economy and Environment (TrEE) Committee will hold a public hearing on April 30 before voting on whether to move the ordinance to the full council. Public hearing details, including ways to comment, are available on the project website. Metro is recommending that Route 140 begin serving The Landing in September 2013. In June 2014, when service begins on the RapidRide F Line, Metro would discontinue Route 110. Metro is also recommending Route 155 be converted to DART service, and Route 909 (DART) be modified to serve Renton Technical College beginning in September 2013. Learn more about Metro’s recommendation. 66% of those who ride Route 110 said their travel needs would or might be met by replacing service on Route 110 with service on the RapidRide F Line. 66% of those who ride Route 155 said their travel needs would or might be met if Route 155 were converted to DART service. 83% of those who ride Route 909 said their travel needs would or might be met if the route were shifted closer to Renton Technical College. You can read the full public engagement report to learn more about the engagement methods used and the feedback we received. Alternative options will be available for everyone affected by these changes, and they will ultimately allow us to serve more riders, more cost-effectively. Metro has recommended the changes to the King County Council. If these changes are adopted, Metro staff members will contact those who told us they were concerned about how these changes will affect their travel and gave us their contact information during our second phase of outreach. We remain committed to helping our customers prepare for this change. Examples of such assistance might be helping people who work along Park Avenue north of South Second Street organize vanpools, or teaching people in Fairwood how to use dial-a-ride transit. The King County Council will act on the September 2013 service change ordinance in May. If it adopts the ordinance, changes to routes 140, 155, and 909 (DART) will begin in September 2013, and F Line service and the discontinuation of Route 110 will begin in June 2014.